Roman Blinds bring an elegant, contemporary style to your home or office décor. 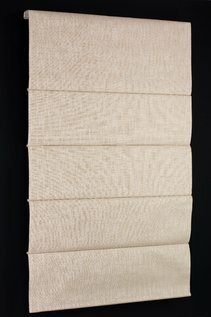 Graceful and practical window furnishing, these blinds are available in 2 fabric ranges and a number of popular colours. With our selection of colours and textures on offer, you are certain to find the perfect roman blinds online to match and complement your interior design, provide the light and shade you need for the purpose of the room, and suit your personal taste and budget. All the blinds within our Romans range are controlled by a cord-operated system which allows the blind to fall and unfold to a precise height and, when raised, gathers the blind in neat folds. The system features a neat and robust inertia-reel locking mechanism that allows you to select precisely the amount of light that enters the room, knowing that your blinds will look great in any position. The custom-made roman blinds in the OzBlinds collection are from the leading manufacturers, we choose them for the quality of their construction and attention to detail and fit. That’s how we are able to assure our customers of many years of trouble-free use. They are also tailor-made in the factory to the measurements each customer gives us (see here for important guidance on how to measure your windows). The result is a sharp, stylish look, agreeably softened by the fall and fold of the blinds’ fabric. Like all the blinds online we have to offer, OzBlinds Romans come with a choice of fabric and choice of colour. Blockout Romans fall to completely exclude light and are suitable for rooms where complete privacy is required, and for rooms used for viewing screens. On the other hand, our Light Filtering Blinds reduce but do not eliminate incoming light, while still providing a good measure of seclusion. Both kinds of blind will give useful reductions in the amount of heat your rooms accumulate, making your air conditioning do less work and saving you money. Fabric Choice – OzBlinds has chosen fabrics which make the most of this pleasing visual tension. We have a large variety of colours and a select variety of fabrics. As fabric colours and textures may vary slightly from their appearance on your screen, we do advise our customers to obtain from us a fabric sample, before completing their order. One of the most appealing features of quality Roman Blinds is their lightness and ease of use. Lift and descent are controlled by a simple cord or chain system. When raised, the blind gathers the fabric into pleats which may be either flat or teardrop shaped. In either case, the blind retains its neat, crisp outline but with a soft, layered effect that is just stunning to look at. And, to protect the kids, all our blinds come with a child safety device. Blinds within our Romans range are precisely made and need precise installation if they are to look their best. We’ve made installing them particularly easy with downloadable PDFs giving clear, step-by-step instructions that make it easy to get a professional looking result. No special tools are required – just a level, a drill and a screwdriver. Since one of the chief purposes of these types of blinds is to exclude harmful UV radiation, it’s important that they themselves by highly tolerant of strong UV light. UV light damages furniture, floors and fabrics by striking them and turning into heat – the so-called “greenhouse” effect. Just like sunburn on human skin, this process of turning UV light into lower frequency light and heat tends to degrade the material in which it takes place, bleaching it and in some cases making it brittle. The exterior surfaces of our blinds are treated with a UV resistant coating which protects both the blind and your room from harmful rays. At OzBlinds, we’re proud to know that our blinds have delighted homeowners and businesses all over Australia. Just take a look at what our customers have to say about our products and our service. If you have any questions about how to buy roman blinds or if you want to find out more about the OzBlinds collection, call our customer service or send us an email and we will be very happy to help you. To find out the price or to purchase your blinds, just head to the product page of your chosen roman blind, enter the dimensions of your window and the price will be displayed. If you are happy with the price, choose the desired options and proceed to checkout. But do remember to read our measuring guide first – our blinds are made to the precise dimensions you give us; “measure twice; cut once”.